Everyone’s favorite holiday is around the corner, and we’re celebrating in the cannabis capital of Europe, Amsterdam, and we’re not alone! We’ve teamed up with our friends from the states, Cheech’s Private Stash. This is going to be the session you don’t want to miss! Audio Kush is proud to partner with Cheech’s Private Stash, a brand owned by notorious marijuana connoisseur and enthusiast, Cheech Marin, half of the acclaimed duo, Cheech and Chong. On 20 April, 2019 the brands come together in Amsterdam to unite those celebrating 420 and to express a deep appreciation for Cannabis culture. This all-day-all-night celebration will include free day time festivities across Amsterdam, ranging from informational sessions and Q&A’s with cannabis activists and influencers including Joey Marin, son of Cheech, to a wide range of ‘smoke-tivities’ for both seasoned and novice smokers alike. Iconic Comedian & Marijuana Activist, Cheech Marin has long been an advocate and appreciator of marijuana. Known foremost for his role in the infamous duo, Cheech & Chong, Marin’s respect for the herb far surpasses his film endeavors. Working alongside his son and daughter, Cheech has expertly developed “Cheech’s Private Stash” which he coins, “a little piece of paradise for the connoisseur of pleasurable living”. An initial product launch in California featured Cheech’s first four strains of cannabis, Sour Diesel, Cookie Glue, Do Si Dos, and Platinum OG, all bred to perfection. The outstanding quality of this product is held in high regard. If Cheech thinks it’s good, it must be! At the late night music event, Cheech’s Private Stash will have free giveaways. Be one of the first 100 attendees and receive an exclusive gift! During the day, Lost In Amsterdam is our official meet up point. Here you will be able to enjoy in a wide-range of ‘smoke-tivities’, dab station, merchandise vendors, informational booths, & this is where we will be departing for the coffeeshop tour! Our coffeeshop tour will take you across Amsterdam Centrum to the most prestigious Coffeeshops, through the Red Light District, and maybe even teach you some history along the way! This is a walking tour, so be prepared! We will be circling through the entire city! This is for seasoned smokers only. During the late night music event, Saxxon will be filming for his upcoming music video, ‘Cheech’s Stash’ featuring T.R.A.C. This track is a promotional track for Cheech Marin’s (of the infamous Cheech & Chong), Cheech’s Private Stash. Come be part of this monumental experience. Generations of youth have grown up smoking with legends Cheech and Chong. This is your opportunity to become a part of the face of Cheech’s Private Stash! 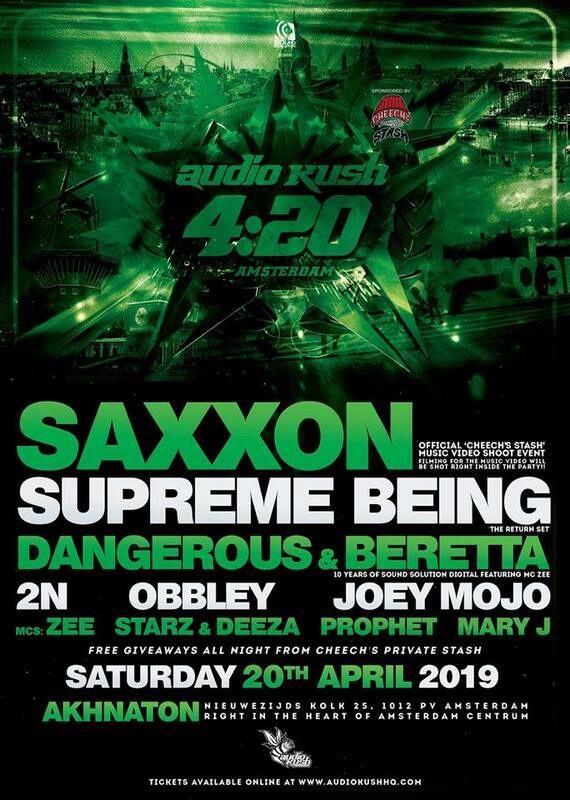 Drum n Bass don, Saxxon’s new release with MC T.R.A.C., “Cheech’s Private Stash”, drops later this year and we will be filming exclusive footage for the music video inside Audio Kush 4:20 at Akhnaton in Amsterdam.